Posted April 8, 2013 by finnfemme & filed under Fashion, Vintage. I finally found an ad featuring Twiggy! I’ve been searching amongst my magazines for a glimpse of one of my favorite ’60s model, Twiggy, to no avail until now. I think, perhaps, it’s because my personal fashion/teen magazine collection is from about 1968 onward, and Twiggy had her modeling heyday in 1966 and 1967. Anyway, this is a very striking, if odd, ad. It’s from the August 1969 issue of Seventeen magazine, “The Biggest Fashion Issue Ever!”. Back in the day, we all looked forward to getting the huge August issue in the mail. Seventeen was especially huge because the pages measured.10.5″ by 13″ and this issue had 480 pages. It is impossible to get the whole page in my scanner, so I had to break it up into two parts. This ad is perhaps on the out side of Twiggy’s modeling career. Photographed by boyfriend, Justin de Villeneuve, she has the 1969 romantic hippie thing going with long tendrils, poet-sleeved mini dress and tall suede boots. She looks incredible, of course, albeit slightly awkward with one finger tentatively poised on the typewriter carriage and the other on a key. 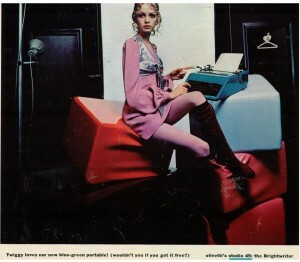 The ad is for Olivetti’s Studio 45: The Brightwriter, with the tag line: “Twiggy loves our new blue-green portable! (wouldn’t you if you got it for free?). Which is weird. Or not. I guess Olivetti perhaps knew that the only way to explain the strange juxtaposition of Twiggy hawking a typewriter, was to say that the only way she loves it was that she got it for free. And, of course a massive modeling fee. 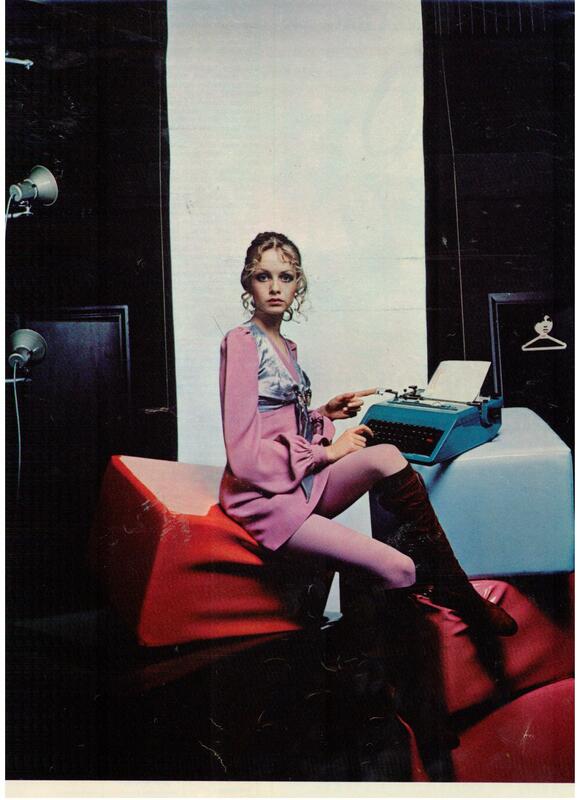 I’m pretty sure that Twiggy’s relationship with a typewriter started and ended with this modeling session. But it is a really groovy typewriter; one that certain hipsters today would kill for. 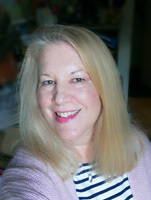 Hi again Marilyn….. Love your Twiggy story…. FYI there is a vintage Seventeen magazine on eBay with Twiggy on the cover. It’s for sale…. 70.00+ I believe. Can you imagine? Also Just lately I have spotted Vintage Vogue magazines with Twiggy covers. They do go fast…. Yes, some of those vintage magazines go for BIG bucks on eBay! I am glad I saved as many as I did. But I would never sell them as they have way too much content for me to use here on my blog. It is so rare to find Twiggy ads, and was extremely happy to at least find this one.